To be brief, my theory of Atlantis is one of the few that takes Plato seriously and literally. Some of you already familiar with my work know of my maps of the sub-continent island of Atlantis positioned some 400 or so miles past the Pillars of Gibraltar. The area of Atlantis as a sub-continental island according to my map, is roughly 2000 x 1000 miles in area with the Royal City being positioned at the Josephine/Torre Seamount. I also conclude that for Atlantis to have been able to govern the entire Mediterranean area, that they must have also been nearby and just outside of the straites as Plato preserved. Naturaly,this control would have been more difficult being months or half a year away from the straites and across the Atlantic, Antarctica, Greenland the Americas or Indonesia. It fascinates me have recently identified an interesting hill, circular arches and a long seawall, whether natural or man made as my photos from Google earth show. 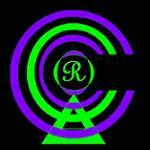 Here's a link to my website for your interest. Ancient Egyptian TATENEN = Risen Primordial Hill of Creation. Hat-nt-iw; Foremost Island of Neith. Plato translated Risen as epanateilantos > anateilantos > ateilantos > atilantos > atlantos > atlantis. We can also relate the old Greek word of ATE as ruined land. Iberia= Basque, Celtic , Portugal, British isles, Hyperborean Europe. Autochthon ( earthborn , native) Phoroneus, Prometheus. Neptune ( Sea/ Land God, Earth-Shaker, Savior of Ships, Horses ) Cleito’s lover. Socrates also interpreted Poseidon (Neptune) to mean "without feet" or at feet's end or Chained Feet, meaning that when man came to the lands edge, he could no longer walk further. Coastal shorelines. Cleito (emperor’s favorite, sloping hill) Acropolis hill, Atlantis Royal City. monument increases to unite the future arrival and remain loyal to the secret of creation." Djet, should actually be before Djer in king lists and also the foremost king after Cleito. Djet and Djer in king lists would be Iteti and Iterti. Obviously they are twins. Den also went by, “the one of the desert” for his Nebty or “two ladies” title of which he was the first pharaoh to use this title that compliments “at both sides” or “two names”. When we include my comparisons in this list and the indication that the Menes or Aha3 ivory label appears to relate a voyage to Atlantis named HAt Nt Tj rw (Atanti) in the Aha3 label and the records that Solon and the priests were looking at in the Temple of Neith, there is astounding evidence that the Egyptians are really Atlanteans as proposed and also indicated by the Atlantean Libyan district of Maerea or Mareotis as the intial rulers of Egypt and Neith’s origin being related to Libya like Athena also was or Neptune. Menes also compares to Poseidon as breaking up the ground around the hill of Cleito to make the royal city when he broke up the ground to dam the Nile around Memphis turning it into an island on the western side and building a lake that bordered the north and east sides of Memphis. This is not to say that Memphis was Atlantis as some suggest the labels are talking about the Nile Delta, nor that these were in fact the original kings of Atlantis, but that they preserved and carried on the names and traditions after the flood (hathor bulls) and the death of the 10 kings as displayed by the “commemorative” Narmer Palette that also shows Menes’ daughter Tjt or Tejati. We also know that there are Libyan Kings prior to Menes as the Turin king list or Palermo stone reveal that support this thesis. Evermore, the underlying factor seems to be that the Aha3 label was the basis for the Atlantean story which also displays a kneeling bull that may relate to this flood also or the fact that Menes drowned and was not killed by wild dogs, crocodiles or wasps as some suggest. Menes and Neith were transformed into Osiris and Isis after the 4th dynasty. Book 10) Where is it? Someone has it. Please return the book to us, It belongs to Man and Woman. You can no longer hide the lies. The Secret of the Books of Herodotus by Riven. Epo- illa- caina- rua- in- mylo- potare- ero- h(ae)cis- pretene- moplema (Mopsus)- ila- hete- pretueo. Epic by that way fallen (Vulcan?) to waste/sorrow into this MYLO > Mysian/ drunken wanderer with his faults, to lie before the Oracle broken Secret Society greatly prized here. Translated with Cassell's New Latin Dictionary, 1959 edition....from Ja. RETURN THE 10TH BOOK OF MYLO....Please, it is a piece of our History, along with the Books of Alexandria....Thankyou. Strangely enough, I also encountered a hidden message of the Politics in the time of Plato while he was imprisoned in Syracuse by the Traitor Dionysios around 360.bC when Plato also penned the Timaeus and Critias. The Critias is the inflated version of the Timaeus that goes into detail about Atlantis and reveals to us the Greek names for the founders and 10 kings of Atlantis. As I did above for Herodotus, we can also write the Atlantean names in order and turn them around to reveal another secret message in Latin! Alternate theory for the Critias dialogue if Plato was sending a hidden message while imprisoned in Syracuse by Dionysius ca 360.bC by Paulo Riven. A 2,367 year old secret revealed from Paulo Riven. Oftenly their ruler at his leisure would steal secretly to the Salentini secret society at the south east end of Italy with a band of brothers of the Macedonian army, while you were accustomed to your memory, towards evening in a galley with seven banks of oars. The Marsians (tall male Germanic Scythians) and Dacians (lower Danube) , went to where the high altar's fire is lit by the Boeotian women, the muses of Aonia near mount Helicon and the spring of Aganippe, the resort of the muses by the river Cephisus in Boeotia to compose by candlelight in the evening. - Paulo J.Tx.Mn (Riven) 2007.aD. (8489.aJA). As you can see from the above translation, not only do we learn a secret about the politics in Plato's era, but we are also being told that Mneseus appears as the main Atlantean King. Here is a map by Ioannes Hugonius A. Linfehofen ca.1595.aD detailing the city of Angra do Heroismo (Cove of the Heroes), on the southern side of the island of Terceira, Azores. I was born on the north eastern side of Terceira in Praia da Victoria (Victory Beach). This map details almost exactly to Critias' description of the plain on the island of Atlantis, albeit the concentric Royal City. The plain was portioned into 60,000 lots and was surrounded by mountains on the south,west and northern sides and open south easterly towards the region of Gades, Spain that matches this map as an excellent visual comparison for us to the Atlantean plain. Looking towards the sea, but in the centre of the whole island, there was a plain which is said to have been the fairest of all plains and very fertile. Near the plain again, and also in the centre of the island at a distance of about fifty stadia, there was a mountain not very high on any side. The whole country was said by him to be very lofty and precipitous on the side of the sea, but the country immediately about and surrounding the city was a level plain, itself surrounded by mountains which descended towards the sea; it was smooth and even, and of an oblong shape, extending in one direction three thousand stadia, but across the centre inland it was two thousand stadia. This part of the island looked towards the south, and was sheltered from the north. The surrounding mountains were celebrated for their number and size and beauty, far beyond any which still exist, having in them also many wealthy villages of country folk, and rivers, and lakes, and meadows supplying food enough for every animal, wild or tame, and much wood of various sorts, abundant for each and every kind of work. As to the population, each of the lots in the plain had to find a leader for the men who were fit for military service, and the size of a lot was a square of ten stadia each way, and the total number of all the lots was sixty thousand. 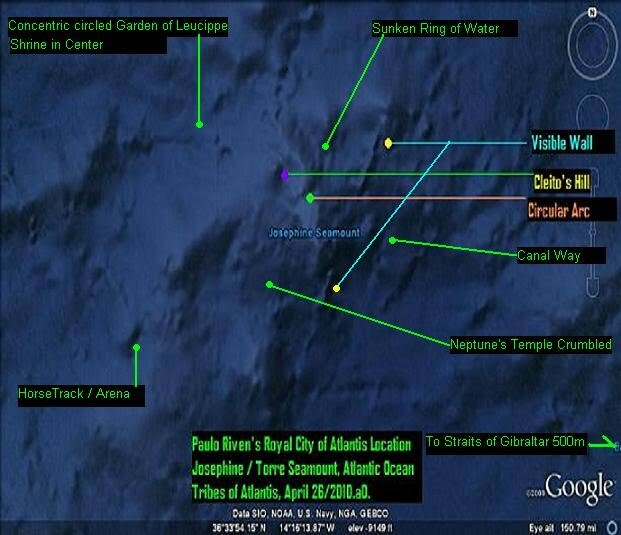 Azores Atlantis I - Atlantic Ocean -150,000,000 - 3253.bC. Around 450 million years ago, in a time geologists call the unified Continents of Earth, Gondawanaland, the Atlantic sea was first forming at the central point or middle Earth up to around 150 million years ago when the Atlantic Ocean would be the result as the Continents drifted apart leaving behind the central sub-Continental Island known as Atlantis, some 2000 x 1000 miles in area around 135 to 150 million years ago. Personaly, I don't believe in the Plate teuctonic theory that massive continents move around the Earth! Maybe sub-continents or islands. This is just for those of you who do! Scientists from NASA and Columbia University, New York, have used computer modeling to successfully reproduce an abrupt climate change that took place 8,200 years ago. At that time, the beginning of the current warm period, climate changes were caused by a massive flood of freshwater into the North Atlantic Ocean. This work is the first to consistently recreate the event by computer modeling, and the first time that the model results have been confirmed by comparison to the climate record, which includes such things as ice core and tree ring data. The study was led by Allegra LeGrande, a graduate student in the department of Earth and Environmental Sciences at Columbia University. The results appeared in the journal Proceedings of the National Academy of Sciences (PNAS) in January 2006. The group used an atmosphere-ocean coupled climate computer model known as "GISS Model E-R" to simulate the climate impact of a massive freshwater flood into the North Atlantic that happened about 8,200 years ago after the end of the last Ice Age. Retreating glaciers opened a route for two ancient meltwater lakes, known as Agassiz and Ojibway, to suddenly and catastrophically drain from the middle of the North American continent. At approximately the same time, climate records show that the Earth experienced its last abrupt climate shift. Scientists believe that the massive freshwater pulse interfered with the ocean's overturning circulation, which distributes heat around the globe. According to the record of what are known as "climate proxies", average air temperatures apparently fell as much as several degrees in some areas of the Northern Hemisphere. Climate researchers use these proxies, chemical signals locked in minerals and ice bubbles as well as pollen and other biological indicators, as indirect measures of temperature and precipitation patterns in the distant past. Because GISS Model E-R incorporates the response of these proxies in its output, the authors of the PNAS study were able to compare their results directly to the historical record. "The flood we looked at was even larger than anything that could happen today," said LeGrande. "Still, it's important for us to study because the real thing occurred during a period when conditions were not that much different from the present day." The study was funded by NASA, National Defense Science and Engineering Graduate Fellowship, and the National Science Foundation. LeGrande, A.N., G.A. Schmidt, D.T. Shindell, C.V. Field, R.L. Miller, D.M. Koch, G. Faluvegi, and G. Hoffmann 2006. Consistent simulations of multiple proxy responses to an abrupt climate change event. Proc. Natl. Acad. Sci. 103, 837-842, doi:10.1073pnas.0510095103. Schmidt, G.A., and A.N. LeGrande 2005. The Goldilocks abrupt climate change event. Quaternary Sci. Rev. 24, 1109-1110, doi:10.1016/j.quascirev.2005.01.015. Hmmmmmm....let's see, 8200 - 2000 = 6200.bC!!! And what is Paulo Riven's First Flood Theory before this article came out? 6482.bC.!!! Paulo Riven's Second Flood: 3250.bC also backed up by PROOF from Stanford University and the Myths of all tribes! Someone asked why I think we are all Atlanteans and another thought my theory was based on 10,000.bC. Science or my research and Spirituality or the myths and my knowing internaly. 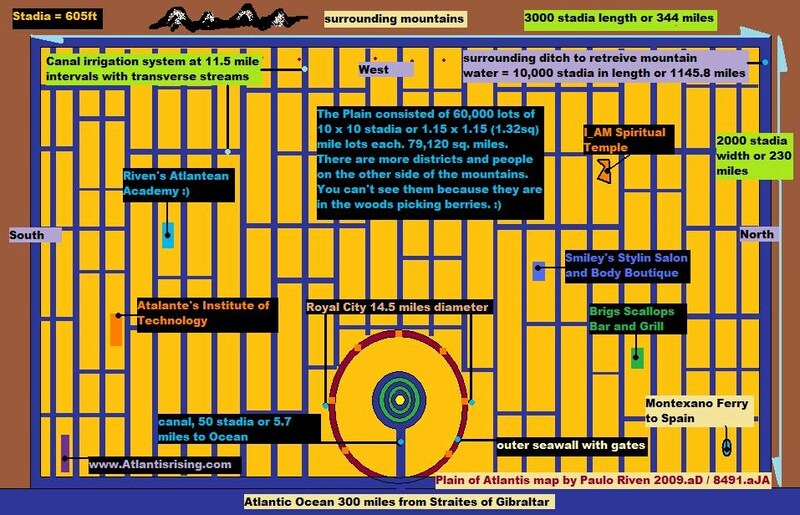 Atlantis I or our old "Middle Earth" back then was on the island in the Atlantic Ocean that most likely separated from Europe and Africa leaving the straits of Gibraltar open and it's curved mouth. In our view of Gondawanaland and teuctonic plate theories, Atlantis would have been central. As an island, it would have been some 150 million years old, but much older as part of Gondawanaland. On either side of the Atlantic we find commonalities like setaria grass, chestnut trees or myths of the Americas saying they came from a destroyed island from the east and in the Atlantic, while for those of Africa,Europe and Asia, they say they came from an island westward of themselves, like the Egyptians or the Rig Vedas and their "White Island". My theory proposes the final destruction and war was ca.3250.bC. Although there is an 885 year window prior to that date, so 4135.bC also qualifies. In that range of 3250-4250.bC. The previous destruction was at 6482.bC. The 9570.bC is from where the legend starts being told according to Solon. It is a "progressive" narrative of the histories up to the final destruction. Egypt was founded 1000 years after or ca.8570.bC, thus the timeframe of 8570 - 3250.bC properly and no later than 1800.bC because that was as far back as Solon could account for. The 10 kings are reflections of the Original Kings of Atlantis I. That is why you can compare them all. The 10 kings were preserved from Atlantis II in Tansania at the Garden that migrated out of Lake Victoria and along the Nile to Egypt where Menes preserved the names in the first Dynasty after the final destruction. From there it spread around the Mediterranean and to Mesopotamia. Finaly being preserved as the 10 patriarchs of the bible. Atlanteans simply means "Foremost of the Earth Land People." Atlas means " Foremost Ruler of the People"
The oldest Goddess artefact is the Tan Tan Goddess found near Rabat, Morocco at Tan Tan, being some 80,000 years old. This was Atlantis II after the 6482.bC destruction and also destroyed from the 3250.bC destruction. Note the circular island shape, the 5 mountains and the flooded coastline. It also sits near Eritrea and the Straits of the Horn of Africa in parallel to the Straits of Gibraltar and Erithea. This is the 2nd Royal City at the Garden of Avila or the Olkarien Gorge with it's concentric circles like Atlantis I's Royal City. images of God's unknown Wisdom or Gemini Secret. So we know 90% of who the Atlantean Kings are as remembered by Tejaru or Lower Egypt that consisted of Sais, Buto, Abu Roash (Asheru) and Saqqara (Rastau / Rosetau). We know that Maerea the 3rd District was the Main or Capital of Tejaru held at Sais,Egypt where the Temple of NeitAmen was or Anita. Menes was 7 years 6 months when he was ascended as King. His Papa Seti obviously murdered as the Horus vs Seti myth portrays.Seti murdered Ausir (Osiris) who was probably someone from Upper Egypt and tied in with the East or simply someone from the east and Phoenicia or even Sargon of Bayblon? Neit would have been co-regent with Menes and probably later when he was an adult could have married him to preserve the bloodlines,unless their was a daughter in the picture from Tjeti, perhaps the MereNeit or the Tejati thought of as Menes' daughter but may have been his wife. Her name clearly reflecting Tjeti before Neit and the primary choice to explain Menes' wife. Therefore she was called "Beloved of Neit" or MereNeit and the district of Maerea named after Her. In any case,Neit was co-regent and "imitated" by the Den Usurper story after Djetaii or Iti. Obviously when Upper Egypt attacked and the beginning for the Atlantean Wars upto when the flood disaster occured and we find an Earthquake also happening in Bubastis around Den and Anedjib. At 20 years and 10 months of Age, Menes United the two lands as seen on the Palermo Stone clearly by the NSW plant (siwa oasis) with both Lower and Upper Egypt on either side below and attached to the Plant. Then as Factual on the stone, Twins were born being Djeta and Djetii.Thus Djetii was termed Autochthon or self born of Ampheres or Djeta. Djeta being Ampheres or "on two sides" because he had a twin. Sometime in the rule of Djetii, the Atlantean wars started with Upper Egypt who revolted from Atlantean rule as my Plato Code clearly shows and tells us that Menes and Evaemon were the main rulers of the era,although Djetii was King because Menes and Neit were still alive. Then Narmer Khaka comes along as Khanubra or Ranebkha or Nekhabranub. Simply known as Raneb or Azaes "the burnt one of Nubia or Upper Egypt > Khaka. Den being a fictional plant or a son or member of Ranub ruling at the same time for Lower Egypt while Ranub returned to Upper Egypt. What exactly was is difficult to say,but we do know who the Usurpers of Upper Egypt were that betrayed Atlantis. 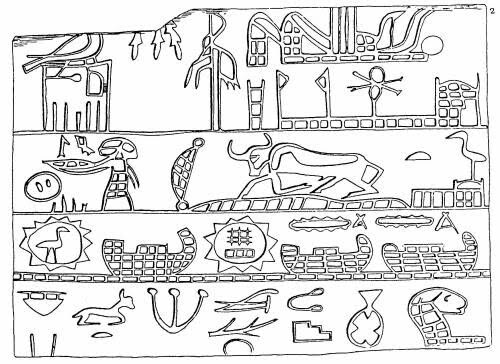 Narmer not being his real name but simply the title of KHAKA for an Upper Egyptian King of smelly fish and cow dung,such as they are. This was even told in our Atlantean Script of Critias that if any of the other kings were to revolt the other kings would come to the rescue. A law written on the Pillars of Atlantis at Amenti-Rosetau. A voyage to Khenti-Amenti Rosetau even recorded on the Palermo Stone and Rosetau of course being mirrored in Saqqara,Egypt. Most likely the flood occuring around the time of Den and Anendjib as the Bubastis earthquake records and the rise of hathor worship by Khaka Narmer Ranub. Tajeru or Lower Egypt being wiped out and her shores off of Alexandria falling into the sea where Frank Goddio and his team picked up the pieces undersea a couple of years ago. Then Snoferu and Khufu murder the Son of God,JASA (Philitis The Shepherd) in the Fire Temple as recorded also on the Palermo Stone for their satanic rituals of the SNF-RA "blood sun worship sacrificing" voodoo cannibal families from Huni and Ranub. The Hermaphrodite bloodlines e'en to Akhenaten,the fraudulent Ramses kings and Phoenicia. The hermaphrodites born, being the kings and queens of the evil familes of SNF-Ra from Khenyas burnt lands,thus Khemet or Azaes for Egypt and Ranub. Then God JA MN or AMEN curses Khufu and Egypt with 150 years of plagues and the exodus occurs towards the end for the Hebrons of Khufu and Abraham of Egypt. Thus the term Hamites for the district also as today.Abra'am probably the same as Khaka Narmer or perhaps a son of Sargon of Babylon who came in through Upper Egypt and why the comparisons of Egypt with Sumeria.Considering the bible says he came from Ur and Sargon or Nimrod. Maybe Nimrod was narmer? Narmer being placed after the flood of Anedjib and Den and as we know,other nations simply move in and take over what's left like Vultures of the golan heights. Narmer capitolizing and disguising himself after murdering Menes who was 63, like the Ramses kings also hide Menes in their names or liars of Amen and the ankh for Phoenicia and the Hittites. Menes sailed to Sumeria as Oannes and probably was under his control. During the Exodus,the Pyramids of Khufu and Khafre (the middle one) and Menkaure's pyramid were built and the sphinx moved from her position at the Rosetau canal. This was bordered by the Atlantean Twin Pyramids of the Great and The Red being built by Tajeru Maerea and Menes who built most of the Great Monuments of Egypt including the Abu Simbel temple at Aswan,Nubia,Luxor and the Karnak Temple's beginnings. Where alike our Atlantean Scripture they appended or added to the temple in consecutive generations of Rulers. Then the upper Egyptian kings changed everything along with the scholars of today like Zahi Khawass who knows the truth about Egypt and it's Atlantean history that they alter or coverup also. Just as they deny the Truth and Facts of Atlantis and label Plato a Liar! Evident by the airshaft stoneplug and why God JAO or JA MN AMEN wrote His name with the two letters of JA on top of the Great Pyramid for me to witness as I did His face upon the airshaft stoneplug. The pictures posted since 2006. Where we also know the Secret of the Eye of Ra as God JA MN at the second Garden of Avila (Eden) in Tansania! With His Wife visible also! Now I don't know the exact story but we are on the right track of trapping those falsifiers of Phanes on the Egyptian board game of Senet! 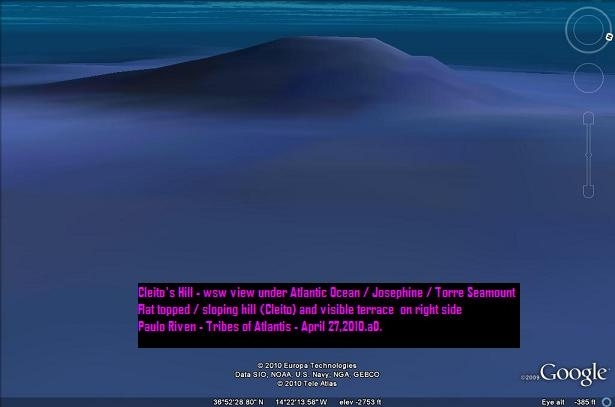 And we do know Atlantis is very real at the Josephine / Torre Amenti-Rosetau Seamount and why the Atlantis legend came from Egypt and why it was also mirrored there in Saqqara! Question is what happened to the other Sphinx by the Red Pyramid? The two Great Atlantean pyramids bordered the Oval rectangular Canal with a lion at either side, while the Memnon giant statues were centered to Greet the Sun, just as it was in Atlantis and seen in my new seamount map. Then they (ZHAKHA of Orion) shifted our Earth and the Sun and Mt Meru and Heru became the new Rosetau of upper Egypt.Thus Amen our Falcon headed God was replaced by Seker or ZAKHA (satan) and the Hawk for Horus. Horus meaning change of hours,time,years or 11:11 from 10:10,God's Time. The Secret of the Ham-Duat or Am-Duat ritual of Evils and ZHAKHA Seker with his Draconian Crocodiles of Sobek. The catch 22 being that 885 years are missing from Khufu,whereas 3474.bC is marked by JASA and the Twin Pyramids were built shortly before Him or in the time of Menes's Rule. Everyone loved Meneses and MaereaNeit, where Great minds build great things. Evil minds build ruins and nobody remembers them! Only when they have to look at their KHAKA smeared all over the place! Guess we know why God's wisdom is hidden in babies to say KHAKA mama, can you change my diapers!They smell like Upper Egypt and Phoenicia! Further evidence for my Josephine Atlantis Royal City Location. Quoted and typed by Paulo Riven from Frank Joseph; Atlantis and other lost worlds. The Horse-Shoe Seamounts; article page 10/11. As early as the first sonar investigation of the Atlantic Ocean in 1949, indications of a lost civilization came to light. Some 418 kilometers due west from the Straits of Gibraltar, Dr Maurice Ewing, aboard the National Geographic research vessel Glomar Challenger, found a formation on the ocean floor since referred to as the Horseshoe Seamounts, comprising a large island ringed by a range of high mountains. The Columbia University geology professor determined that its highest peak, dubbed Mt Ampere, was a volcano that collapsed beneath the sea within the past 12,000 years. So too, the fourth century bC philosopher Plato characterized Atlantis as a large island beyond the Gibraltar and surrounded by a great ring of mountains over-whelmed by a natural catastrophe 11,500 years ago. Core samples taken from the ocean floor more than 3 kilometers deep, came up with prodigious amounts of beach sand. Physical evidence for a former shoreline that once had been subject to untold centuries of wave action at sea level. This was proof that the deep ocean landmass had at one time in the recent geological past been dry territory above sea level and for a very long time. Moreover, the estimated dimensions of the Horseshoe Seamounts -515 kilometers from west to east by 310 kilometers from north to south -loosely compliment the dimensions Plato gives us in the Kritias for the island of Atlantis 588 kilometers from west to east by 365 kilometers from north to south. Both sets of measurements are of course approximate, leaving room for a compromised medium that suggests commonality. Less than ten years after Dr Ewing's first discovery of Mt Ampere, Stockholm's Riks museum launched a Swedish deep-sea expedition under the command of Dr Rene Malais, aboard the research vessel Albatross. From the ocean floor about 2 kilometers beneath the surface of the Atlantic, the scientists brought aboard fossilized remains of several thousand diatoms, small algae that flourished over the past 12,000 years. Dr Malaise's palaeo-biologist colleague R.W.Kolbe went on to catalogue more than 60 freshwater diatom species at 1 kilometer depths and deeper across the mid-Atlantic. Such an unexpected abundance of retrieved algae plants proved that they once grew in far spreading freshwater lakes on what could only have been a former stretch of dry land territory located in the vastness of today's open sea. Kolbe's conclusion was supported by additional evidence uncovered in 1963 by an oceanographer for the Soviet Academy of Sciences. While investigating an area of the Horseshoe Seamounts from the Mikhail Lomonsov's deck, Dr Maria Klinova's robotic devices scooped up several unusual rocks from the sea floor. Laboratory testing showed that the specimens had not been formed at the 1.6-kilometer depths where they were found, but on dry land about 10,000 years ago. Revelations such as these have convinced marine scientists that a large mountainous land mass somewhat smaller in area than Portugal (about 90,000 square kilometers) did in fact occupy the mid-Atlantic Ocean with the past 10,000 years. The Mount Ampere Discoveries; page 13. Although the base of Mt Ampere plummets more than 3,000 meters, it's plateau like summit is a mere 65 meters beneath the surface of the Ocean. It was here according to the Znanie-Sila article, that Russian Scientists found most of the man made features. These included a wall 75 centimeters wide, 1.5 meters high and slightly longer in length. Other masonry consisted of five broad steps ascending to an expansive platform connected to another monumental staircase. If, as Dr Barinova speculated, all the visually documented structures protruded through a layer of silt perhaps 30 or more meters thick, Marakuev's photographic evidence revealed only a fraction of their uppermost portions. Several return voyages to Mt Amperes under taken by the Academician Petrovsky throughout the 1980's reconfirmed and even expanded the underwater discoveries. They were greeted with cautious interest in the West, where suspicion of all things Soviet ran high until the collapse of the Soviet Union at the end of the decade. Since then, post Communist Russia has lacked the financial where-with all to renew its investigation of man made structures in the near Atlantic, while Western archaeologists are skeptical of claims by Dr Barinova and his colleagues, who are still reluctant to share everything they found at the Horseshoe Seamounts. In his Znanie-Sila article, Barinova cited the immense mantle of silt that lies over the ruins like an obscuring cloak, concealing virtually every trace of physical evidence. It is this constant deposition, which has gradually but continuously descended over the ruins, not for centuries, but for millennia, making their detection difficult in the extreme. To locate and reveal them, modern research instruments would need to make kilometers of ocean transparent and probe through amounts of sedimentary silt sufficient to hide a building or even a city. (Riven note; this Znanie Sila article is probably the same one reported in the New York Times in May 21,1979 with the expedition of Professor Aksyonov of the Russian Academy of Sciences. Marakuev being the same photographer. The Soviet discoveries at the Ampere Seamount, unpublicized for several years, received worldwide publicity in 1979 through an interview with Professor Andrei Aksyonov, deputy director of the Soviet Academy of Science's Institute of Oceanography. The interview took place in Moscow and was published in THE NEW YORK TIMES on May 21, 1979. Professor Aksyonov, while guarding a seemingly neutrality on Atlantean identification of the ruins, further stated, "I believe that the objects in the pictures once stood on the surface." In a later AP release from Moscow in April 1979, Alexander Nesterenko, director of the Fleet Department of the Institute of Oceanography, confirmed the report, that a research ship had taken photographs of "what might be ruins", but denied reports that another Soviet research ship, the VITYAZ, was investigating the same site, stating that the VITYAZ was "engaged in other business." By CRAIG R. WHITNEY Special to The New York Times. MOSCOW, May 20 -- Plato, Sir Arthur Conan Doyle and all you science fiction writers, who have puzzled over the riddle of the lost continent of Atlantis, move over for Prof. Andrei Arkadyevich Aksyonov. Page 30: Prominent Metaphysician A.N.Whitehead; “The safest general characterization of the European philosophical tradition is that it consists of a series of footnotes to Plato. It is impossible to imagine a more credible source for Atlantis as fact”. Swedish Medical Pioneer, archaeologist and botanist, Olaus Rudbeck who was fluent in Greek, Latin and Hebrew, concluded after a long research ca.1651-1698 that Atlantis was a fact and not fiction. Later it was discovered that Scandinavia’s Bronze Age settlement dated around 2200.bC as Olaus claimed the Atlanteans settled there around 2400.bC. Chapter 7 Frank Joseph also agrees that Egypt was an Atlantean settlement as I do and have proven. The bones of numerous elephants have been dredged up from the area, beach sand and algae have also been retrieved, proving that this region of the ocean was dry land in the recent geological past. I have a problem with the pangaea theory as main stream science tells us. I do agree that techtonic plates were once joined, closer together etc. But when thinking about them seperating it kind of means that because the earth is a globe, when 2 plates move apart it would mean that those plates would be pushed together on the opposite side of the globe. The theory as we are told puzzles me a little. I found this youtube clip which kind of makes a little more sense to me. If the universe is expanding, then could the earth and indeed other planets mirror this? "As above so below" springs to mind and my thoughts in explaining what the ancients saw in the sky thousands of years ago fit a little around the expanding universe. Most people have a problem imagining how the ancients knew about what was in the heavens without the technology that we have today. Yet, if the solar system was smaller then the planets would be closer and as such visible to the naked eye. Great subject by the way. Sorry for launching in with comments on your thread without my even introducing myself, first post and all that. I just had this info on my mind and had to share it immediately. Hello, and I'm delighted to have found this forum. Thankyou for joining TOA forums. I do remember you. Yes I totally agree with you and I personally don't believe that monolithic continents move around the globe. Small islands or sub-continental islands like India once was or Australia perhaps but not giant continents. As you suggested,it is common sense that if they are spreading then they would collide on the other side. Personaly,I agree that water and erosions alter the overall shorelines of continents by the oceans having formed. What once was a lake and streams became seas and rivers that became Oceans and why the continentes "appear" to fit on either side of the Atlantic from the ancient river flow that became the Atlantic Ocean. Giant cracks like the mid-atlantic mar spreading or ocean crust plates causing pressures on the coastlines to have formed Mountains aside of volcanic chains. I would imagine that planets within the range of their suns like ours that would be capable of producing water would be the same way. Mars is also a good example and something tragic happened there like a giant comet or mass nuclear explosion as evident by the giant chasm on it's one side.Perhaps turing it into the red planet of barreness and devoid of life. Unless some life forms somehow survive underground? Aside of God implanting great and unknown wisdoms in certain people of Earth or even people recalling past life experiences in dreams or deja vu,I would also agree that beings from other planets have visited Earth and passed on knowledge or inter-bred with us.This seems to be what many ancient cultures also hint at as well as those "fish or amphibian" creatures termed as reptillian aliens that appear to be from Orion. 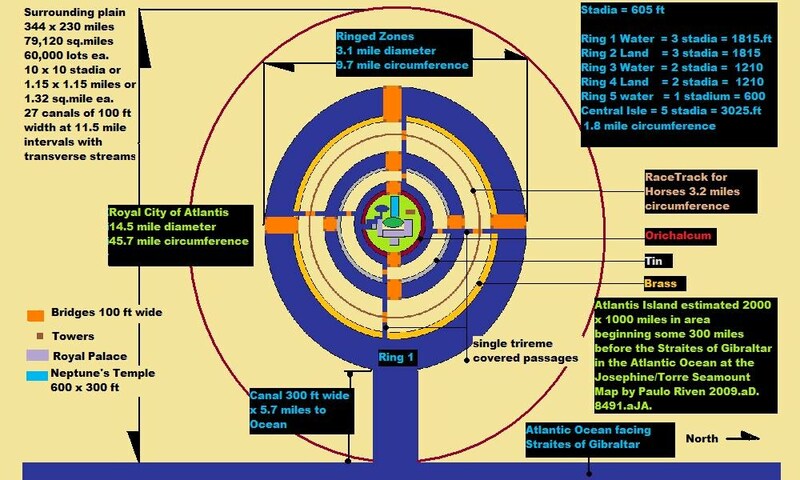 The best evidence of this being the Dogons of Mali and the Richat structure as a UFO footprint. Moscow, May 20 - Plato, Sir Arthur Conan Doyle and all you science fiction writers who have puzzled over the lost Continent of Atlantis, move over for Prof. Andrei Arkadyevich Aksyonov. Soviet scientists may maintain that the so-called Bermuda Triangle, an area in the Atlantic where mysterious disappearances of ships and planes is said to have occurred, is nothing but water and that flying saucers are optical illusions. But Prof. Aksyonov says he has photographs of man-made stone walls and staircases at a depth of about 200 feet in the Atlantic Ocean, 275 miles southwest of the Portuguese coast. "It's possible that it's a part of Atlantis, maybe not the whole thing, but a part," Dr. Aksyonov said. He is a man of established scientific reputation, a deputy director of the Institute of Oceanology of the Soviet Academy of Sciences. His evidence, he concedes, is limited: two pictures showing eleven stones that he believes bear the mark of human handiwork. The photographs were taken two years ago, not by Dr. Aksyonov but by a colleague, Vladimir I. Marakuyev. 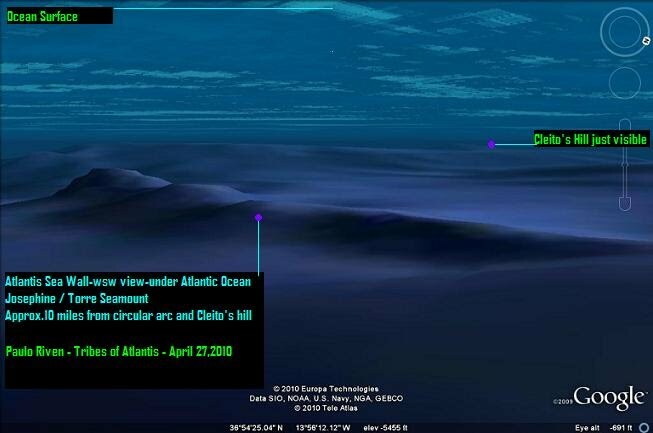 With a submersible camera on the submerged summit of the Ampere Seamount, a dormant volcano midway between Lisbon and the Madeira archipelago. The ocean floor around the seamount is more than 10,000 feet below the surface. In his office at the institute, Dr. Aksyonov said recently that he was sorry but he could not show the pictures. "They belong to Marakuyev, and he is very sick with a heart condition in the hospital," he said. "I think they'll be published in one of our scientific journals sometime soon." Mr. Marakuyev apparently did not realize what he had until late last year, when he got around to developing film from a 1977 exploration of the seamount that he had made in the Soviet research vessel Moskovsky Universitet. "I don't know why it took him so long to get to them," Dr, Aksyonov said. He will not say he has discovered Atlantis, but he offers free directions to anybody else who wants to. "All you would have to do is take a ship with the right equipment to the Ampere Seamount, go down 60 meters, find the stones and bring them up to see if they are manmade or not," he said. "It's my personal opinion that they are." Accounts of the discovery were published in Europe earlier this spring, and Dr. Aksyonov says they brought amused smiles from oceanographer colleagues in Denmark. "I asked them, 'Did any of you believe this?' They said 'No,' and they said they laughed a lot." As he describes the pictures, of a total of eight, only two are really interesting. "One of them shows eight stones - four square ones and four rounded ones in a line about three and a half or four feet long," he said. "Specialists who've looked at it say it's a typical wall from antiquity. The second photo shows three equally spaced stones at the left-hand edge, and it appears to be part of a staircase." Dr. Akysonov just returned from an unrelated oceanographic cruise in his research ship, the Vityaz. "Heinrich Schliemann, the great 19th-century German archeologist, found the ruins of Troy by studying the poetry of Homer very attentively," he said. Mr. Schliemann, too, got a skeptical reaction at first. Atlantis was described in two of his dialogues, the Timaeus and the Critias. "Plato says it was located in the Atlantic Ocean and on an island and that tribes living on it took part in wars in southern Europe and in North Africa before one day the island sank between walls of water," Dr. Aksyonov said. "I believe that the objects in the pictures once stood on the surface too, though specialists say it's difficult to believe the seamount could have sunk so far," he said. He says that the catastrophe earthquake in Lisbon in 1755 caused a tidal wave and a flood that left part of the city forever beneath the sea. Something similar, he surmises, may have happened to an island of which the Ampere Seamount would be the submarine remnant. The legends around Atlantis have been nourished over the centuries. It has been variously located in America, Scandinavia, the Middle East and the Canary Islands, 500 miles south of the Ampere Seamount. "The ocean is full of mysteries," Dr. Aksyonov says. "And our investigations are the beginning of our understanding." 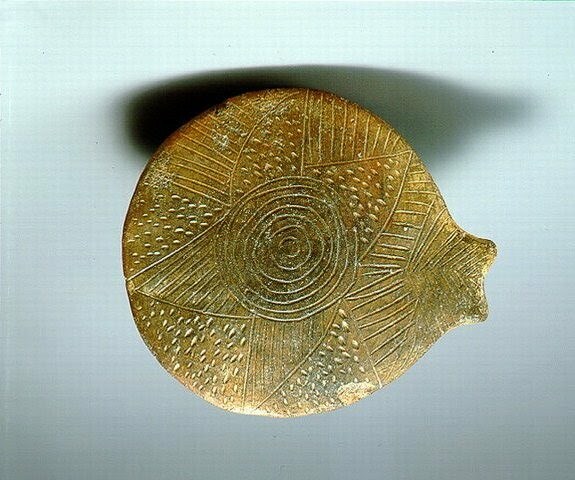 There is another thing that bothers me about anything other than the 9000 years, Riven, and that is why there is no writings about it. Written records extend that far back, yet nothing was written even remotely describing what mirrors Plato's description of what he was told. The main fact is that the Atlantis story came from Egypt. The second main fact is that Atlantis is suppressed and has been ever since it was realeased in Egypt to Solon. The third main fact is that Upper Egypt took over the Atlantean Lower Egyptians and also destroyed or altered their kings as the evidence proves for the hawk of horus replacing the Falcon of Amen,the Palermo Stone and kings or queens recordings being defaced and altered. It's not hard to sand everything down or cover it up with plaster and rewrite or redraw the new rulers. Then in 444.bC came another big lie and the bible. The bible itself changing the course of all historical records and capping everyone to around 3000.bC so Adam could be 4004 usher bc. The other big change being around 400.aD when the Library of Alexandria fell for the library of Pergamon to receive and re-account it's books for the Eastern lies. There are two great truths that Atlantis holds. God and it's title deed to the Earth and all it's lands that were stolen from them. Thus they suppress it even today. Whereas actual records to Atlantis may be kept in secret somewhere like the missing sphinx or it's "psychic" impression of Atlantean Chronicals being buried under it. The other important factor is that alike the pharaohs names who were hidden in the bible, the Egyptian names for Atlantis and it's members were also hidden other than to state that Solon translated the names from the Egyptian. However,considering all of the above, other stories we read today may actually be older legends or corrupted myths by the suppressors (and we know who they are). For example the sea people invasions of Ramses and Medinet Habu or the Greek myths or even the Hyksos stories. A clear indication being of the fact that Ulysses visited the Atlantean Princess Calypso and may have been moved up to the Trojan War myth or that the name "Critias" itself in latin means "hebrew judges" as a Platonic clue to the eastern takeovers as Zeus itself also was for Jove and the Greek people. Thus they became H-ellanized and elapsed into the "dark ages" prior to and after Homer. Even great cities like Sais or the extremely important temples of Neit disappeared. Another clear example is Amen or Ja Mn being altered to RA or Menes's name being disguised as RA - mses as evident by the Abu Simbel Temple. So now it tells a different story and time era simply for the fact of the ruler's new name. The Good news is that we do know for a fact that Maerea was the initial and Atlantean settlement for Egypt and that Maerea is still written all over the place. We are also closer to the name of Atlantis with Maerea Tejataru and my other name for Atlantis in Egyptian being Hat.ta.ntr.iw or having the lion symbol. Something to keep an eye out for the glyphic writings, aside of other "H" signs,as clues to Atlantis stories being preserved. The best news being that my map of Atlantis Josephine does in fact mirror precisely how Saqqara Rosetau of the Egyptian Am-Duat legend, would have looked as testimony to not only Maerea but that Egypt was in fact built and originated by Atlanteans who were there at least 1000 years prior to the Khaka voodoo pharaohs of Upper Egypt and their "hawks" of corruption. 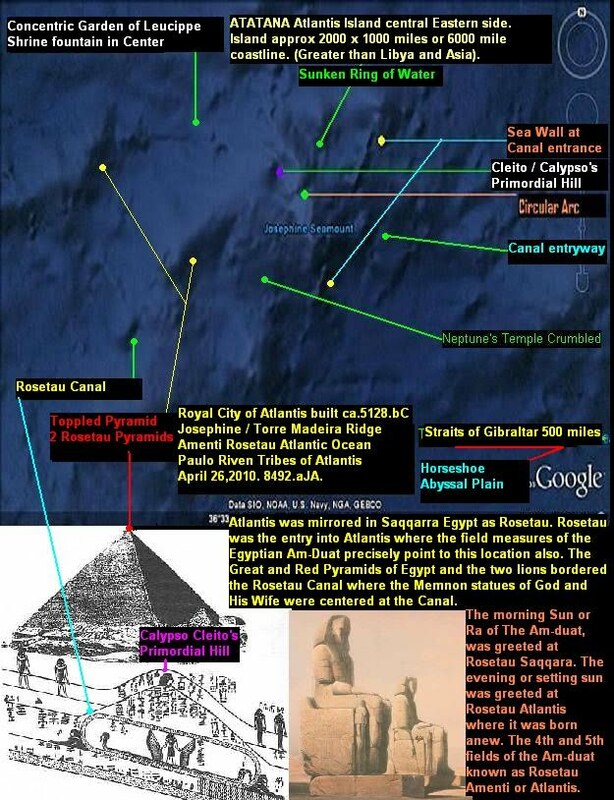 What this all means is that records of Atlantis must be and are in fact still in existence for Egypt,Asia and Europe. We just know them by different stories or lies and that is why the Atlantis legend came and was preserved from Egypt. There's still all the other evidence to surface for Libya,Tunisia,Algeria,Morocco and Europe. Part of the reason why languages like Linear A or the Phaistos disk or even Egyptian heiroglyphs aren't fully understood and why it takes so long so they can get their own "decipherment" code corrected and in place for their own versions of their lies and rework or refabricate the relics like the Palermo Stone or the Narmer palette that sat for at least 100 years hidden away and released in the last 2 years only. A clear factor being that the Palermo Stone is in fact read from left to right and not right to left because of MereNeiths pregnancy and the twins being born in the next square rightside of her on the second row! Moreover,if the Palermo Stone reveals that hieroglyphs can also be read in the other direction and that they can and do inject their own newer hieroglyphs to alter words, how many more lies is there yet to uncover in Egypt and other nations? HaHa, it's so ironic! Not only did Menes and Mereneit trap Narmer's lie between them on the top row like the Egyptian game of Senet, but Mereneit whose name is also Maat or Truth, does in fact reveal the truths of the stone! We are winning Smiley and Atlantis does exist at Josephine, of that I am 99% sure. Just as I and the Palermo Stone have revealed our truth about our True God Creator and His Son and the 2454 year old lie of the bible's yahweh and the 5480 year old lie of the Upper Egyptian khaka yoruba voodoo pharaohs! What are they ever to do now? Where can they hide? How could they explain to their people that they have been lied to and that Osiris and Isis are but myths of Ra? Miracles do and will happen and slowly but surely our planet and it's new consciousness are awaking to these very facts! I made a new map of Atlantis Royal City at Josephine Seamount, showing what you're seeing and how it should look. My apologies are in order due to my falling 5 stories and busting my heels and wrist bones along with damaged lumbar 2 and 3 spinal bones. This occurred Wed march 2nd around 1:50 -2am in the morning. I have been operated on and am currently confined for about 6 weeks to this hospital bed. I will also post later about my Incredible weekend and my journey through time itself. Once again, sorry and I am always with you all as Amen our Creator also is. Alike myself, most of us grew up thinking Atlantis was a magical underwater city with crystals and mysterious seahorse like creatures. Seldom did we ever think that it was once a real to life city thriving with our "Foremost Earthland" people, the Atlanteans, as we still are today their offspring. It is important for us to realize what Plato meant by "BEFORE" or in front of the straits, that identifies the island of Atlantis having been in the Atlantic Ocean and not anywhere "INSIDE" the Mediterranean Sea. As I have discussed and argued many times before, it is simple to imagine the Mediterranean as your house and if you are inside your house, you are not Before or in front of your door, basicaly speaking. Your actualy after or behind your door because you stand inside the house. Seems complicated, but it is quite simple. This is the same view for the Mediterranean as your house, and before means in the Atlantic Ocean. Someone ringing your doorbell is before or in front of your door, and when you let them in, they are after or behind the door as you also are...see? This is specifically what Plato or the many translators meant by before the straites and that Atlantis island was in fact in the Atlantic Ocean. The other factor is that those men at their epoch of telling the tale of Atlantis with Solon of 570.bC, knew the other oceans by their appropriate names also,such as the Euxine for the Black or the Erythranaen for the Indian or south Atlantic/Pacific Ocean area. Point 1...Atlantic Ocean and Before the straits of Gibraltar or Gades, Spain,where Atlantis island faced to on it's eastern shores. The eastern shores was also the locale of the Royal City, moreover at it's center of the eastern side. The other important factor,as I mentioned before, is that Atlantis had to be in a proximity of being able to maintain their control of Europe and Africa and the Mediterranean areas.South and North America or Greenland or Indonesia Pacific being too far to control the mediterranean area without uprisings by rebels or nations. Point 2. Atlantis must have been within a logical distance to maintain control of the Mediterranean lands. The other startling and important factor, is that the earliest Egyptians and Minoans of the Double Falcon era around 4000.bC, were Atlanteans. We also know this because Libya was under Atlantean rule alike our Libyan pharaoh Amasis 2 and our Atlantean king Menes who oversaw the rulership of Atlantean Maerea, the provincial territory of Atlantis in the Delta Nile and why we also find a King Mneseus in our Atlantean legend. To the Egyptians, Atlantis was known as Tatenen or the western lands of Creation that was also remembered as the Formeost Island or Khneti Amenti Rosetau. The exact same as it was memorilized in Saqqarra Egypt. It was even more startling for myself to discover that the field measures of the Egyptian legend of the Sun, the Am-Duat, pointed precisely to my Josephine Atlantis Royal City location. Point 3. Atlantis is Tatenen and Khenti Amenti Rosetau precisely as the Egyptian Am-Duat relates. Hat-Ta-Ntr-Iw or Foremost Earthland Island of God,Amen. Point 4. Josephine's location is both tropical to sub-tropical and precisely as Plato preserved in the Timaeus and Critias. That is,before and near the mouth or strats of Gibraltar. Point 5. The Russian expedition of Prof Aksyonov discovered man made walls and steps at nearby Amperes Seamount. We don't need to further relate all the other evidence like beach sand or animal bones being dredged up from below. Point 6. Atlantis was a stepping stone to a boundless lands,meaning the Americas, Arctic and Antarctica that further provenances my large island and Josephine's location. So not only is Josephine in proximity to the Mediterranean to maintain control, but also able to transfer to the other lands. Ironicaly, the Azores island groups, my birthplace, being 9 islands, while the main island of Atlantis is missing. The 10th or in reality the first. ..................JOSEPHINE SEAMOUNT...............then SOLOEIS RICHAT..........then TANSANIA. Problem is, will they release our truths or continue to mislead us like their religions? Men of Wisdom and Time.